Paul Quam was a manager at Spokane-area drive-ins and the Garland Theater. Read Mike Bookey’s related cover story on the final summer of the region’s last drive-in movie theater here. I met Joe Rosenfield of Favorite Theaters, a company that operated several Spokane-area drive-in theaters, in 1964 to ask him about an item he had that I wanted to buy. After 10 minutes of talking, he asked me if I would work for him at the West End Drive-In. He said I would be an assistant manager, and we agreed that I’d start out at the West End soon thereafter. But six days later, he transferred a manager from the Auto Vue Drive-In to the East Sprague Drive-In, and the manager I was training with moved to The Auto Vue. Just like that, I became the new manager of the West End Drive-In. Eventually, Mr. Rosenfield decided to retire and sold Favorite Theaters to Sterling Recreation Organization (SRO) out of Seattle, but I stayed on at the West End for another 10 years. Expo ’74 came alive downtown and I ventured into indoor theaters. 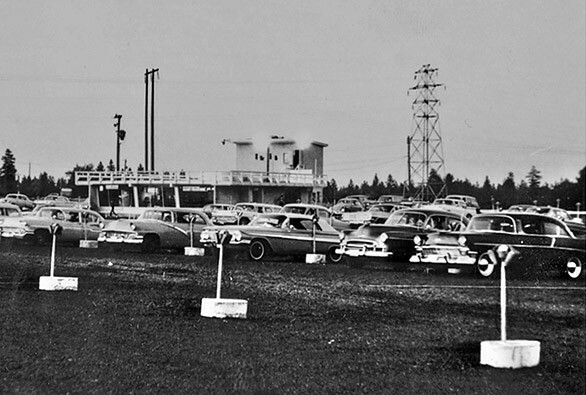 Later, I was asked to manage the East Sprague Drive-In, which had Spokane’s best drive-in scene.We tried something there we’d heard was working well in Seattle and Tacoma — a “swap-o-rama”where people could set up tables and sell “stuff.” We did it for one year and it failed. I tried to convince SRO that it could work, but to no avail. Finally, it was time for me to move inside. I became manager of the Lincoln Heights triplex, then later the Garland Theater, where I worked until I retired in 1998. Looking back, I learned that operating drive-in theaters is not a huge moneymaker. Back then, both the East Sprague and North Cedar theaters operated in the winter and offered free use of electric heaters so people wouldn’t idle their cars to stay warm. It cost a lot just to remove the snow. When the snow was falling, the picture appeared on the snowflakes, but often never reached the screen. Fog was another enemy. The West End was the first to close, in 1983. A year later the East Trent Motor Inn followed in its wake, along with the Autovue on North Division. The “Y” showed its last movie in 1985 before becoming a car lot. That year also saw the last of the Starlight Drive-In on the Newport Highway. Both the East Sprague and North Cedar Drive-Ins closed in 1993, ending an era loved by thousands of families and those who dated under the stars. These days, the film industry has realized that handling 35mm movie film is labor-intensive and expensive. The digital format saves millions, but that savings isn’t passed on to the patron. Soon movies will appear in our homes off a satellite, with commercials running during the film itself. Maybe kids today are used to that. But I know my kids, and many others over 40, have fond memories of going to the drive-in to see movies that families could all watch together. Drive-ins — the movies under the stars — are gone from our region, but they are not forgotten.